Ella Dawson was born Ella St George in Charters Towers in 1899. She moved to Townsville just before World War 2. After the war she became the official accompanist of the Townsville Choral and Orchestral Society, a position she held from 1948 to 1975. In that time, she accompanied the society at every North Queensland Eisteddfod and musical production in the Theatre Royal. As well, she accompanied many soloists at eisteddfodau and concerts and was the official accompanist for the Neil Walker Dance Studio. 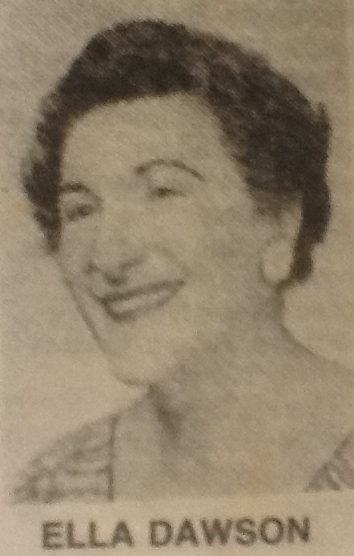 As a life member of the Choral and Orchestral Society she was associated with the Townsville Juvenile Eisteddfod as accompanist for dance sections. Ella moved to Melbourne in 1975 to be near her family, and continued her musical activities until just before her death. Ella Dawson left her mark on the Townsville musical world, and will be remembered and missed by all who knew her as one of the finest and most dedicated pianists and accompanists in the city.